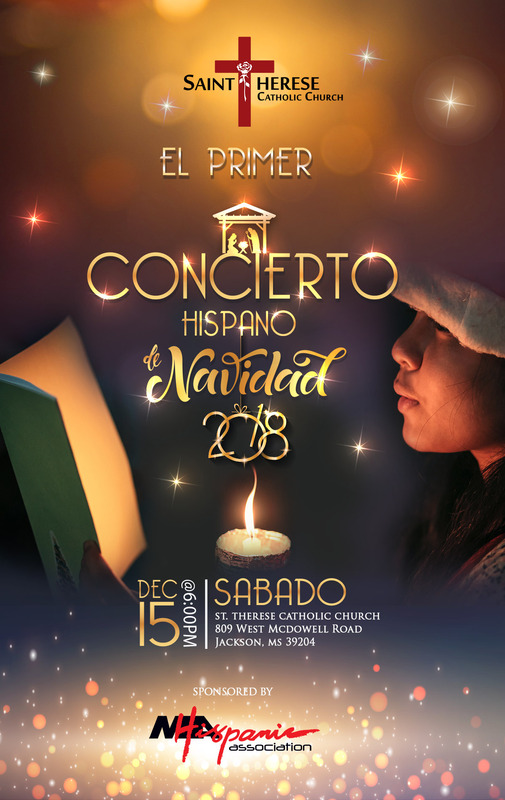 The Mississippi Hispanic Association (MHA) is currently organizing the first “Hispanic Christmas Concert,” which will take place in the Parish of Saint Therese located in south Jackson (309 W. McDowell Rd. 39284) on Saturday, December 15th, 2018, from 6:00 to 8:00p.m. This Hispanic Christmas Concert, the first of its kind in Mississippi, may be a great opportunity to display your talent. MHA encourages individuals, duets, and groups that want to showcase their musical talent to participate. The Parish of Saint Therese has been selected as the place to launch this initiative for various reasons, such as the convenience of venue and date but, most importantly, MHA appreciates Monsignor Sunds’ (priest of St. Therese Church) enthusiasm and support of the various activities and projects of our diverse community. This event is intended solely as a concert, and no awards will be presented. St. Therese as well as MHA are non-profit organizations. However, out-of-town participants may request and be granted a small stipend for meals and transportation. MHA, the main sponsor, is open to sponsorship opportunities from individuals and/or organizations that support Hispanic culture and art. Of course, interested participants are expected to follow some guidelines and conditions as outlined below in order to ensure the success and artistic integrity of this event. It is MHA’s hope that this event may become an addition to the wonderful, musical Christmas traditions of Mississippi. Each individual, duet or group may only present a maximum of two (2) songs. Both of these musical pieces must be in Spanish. No songs may be repeated. These songs must be of a Christmas theme, hopefully coming from the country of origin of the participants. Keep in mind this is a Latin American Christmas Concert. There are popular songs of religious character, and you may select one and only one of these as the two pieces total for the obvious reason that “villancicos” are the preferred Christmas music of the season. Be original and creative. Invent something new for your performance. As an individual performer, you may bring pre-recorded music. If a duet or a group, live music is not only ideal but expected. If you have a video that you would like to use as a back-drop, you should let us know in advance (via email), so we may well-prepared to best display your video during the concert performance. For the presentation: introduce yourself and the group, the musical piece and any other interesting or relevant information you would like the public to know. You may present a traditional North American Christmas Carol; however, it must be translated and interpreted in Spanish. You are expected to provide your own musical accompaniment (it can be pre-recorded), and this is a very important requisite. A performance without musical accompaniment will not be allowed. Groups should be small, no more than 5 to 6 participants, due to the limitations of time and space. There is a piano in the auditorium for your use. Participants should register no later than December 1, 2018 (to ensure their names are included in the program). After the December 1st deadline, late registrations will be accepted on a case-by-case basis, depending on time slot availability. Take into consideration that there will be a general rehearsal. Be open and available to practice in order to ensure quality of presentation. Remember, there will be a video of your performance, which will be made available for you and the general public. And finally, please accept this invitation! You should email or call one of the coordinators below. MHA personnel will notify you with the status of the acceptance as soon as is possible. We would like to meet you prior to the performance, so invite us to meet you and/or your group. Whether at a church, residence or some other location, let us attend a rehearsal. The Mississippi Hispanic Association (MHA) is the sole organizer of this event. Our mission is to cultivate Hispanic culture in Mississippi, and we have been serving the Hispanic community in Mississippi for more than twenty years. The principal contacts for this event are Esperanza Velásquez and Elsa Baughman. Find out more about MHA by browsing our webpage www.mshispanicassociation.org and contact us via join@mshispanicassociation.org.